Newfangled sturgeon catcher or what? The Inland 20 class is seeing a number of innovations that have been standard gear on bigger scows for years. The self-dousing spinnaker well appeared on two boats at the spring regatta at Indian Lake, Ohio. Tempting though it may be, the chute eater requires heavy modification. Gone is the splash rail. In goes a long mesh bag alongside the bilge board. 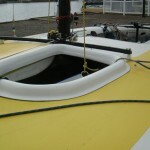 A button on the belly of the spinnaker gets a pull cord. And….there is that problem with sturgeon jumping into the hole. Nevertheles, a five second douse is an advantage. Stay tuned. Then we have the rudders. Willie Crear is pushing his weed shedding design. These are swept back a few degrees to avoid carrying weeds along. Several folks at Indian Lake swear by Crear’s profile. 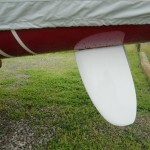 Others are installing e-scow rudders, which are not as deep but still have an elliptical profile. Either way, the deeper profile greatly improves downwind helm, which can be lost when using the vintage license plates on most Potomac boats. But the deeper draft may be difficult in the sandy shoals of our river.